Yoga in the workplace builds a tribe. Your tribe will love you for nurturing their mind, body and soul. Why welcome yoga into your workplace? Our happy teachers come to you. A highly specialised workplace wellness instructor comes to you at a time of your choice. Yogic and Pilates sequences designed to create mental clarity and counteract our culture of sitting. 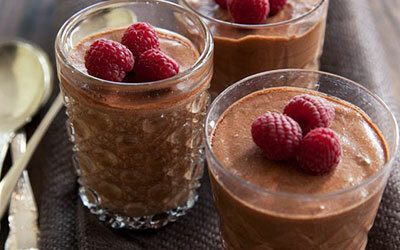 Your team head back to their desks feeling refreshed and recharged. They’ll be more creative and efficient for the rest of the day. Happy, efficient teams stimulate business growth and foster healthy working environments. Each program is tailored for your workplace, based on your individual team’s needs, location and practice space. Classes can be bolted together or delivered separately across a timetabled week. Signature 50 or 60 minuteflow classes to get people moving and smiling, raise their heart rate and move every inch of their bodies. Great for the health-conscious corporate crowd. 50 or 60 mins gentle classes following a more traditional movement practice with meditation. Suitable for any body, any age. 20 or 30 mins meditation and breathing classes that are perfect for lunch breaks as there’s no need to change. Just come, sit and be still to recharge and destress. 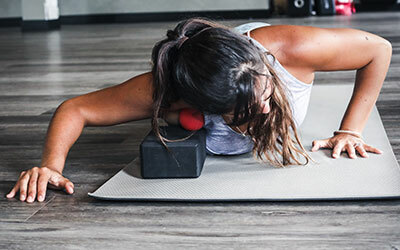 50 or 60 minute power mat pilates sessions to get butts and abs burning, while strengthening the core and working on posture to counteract long days in the office. 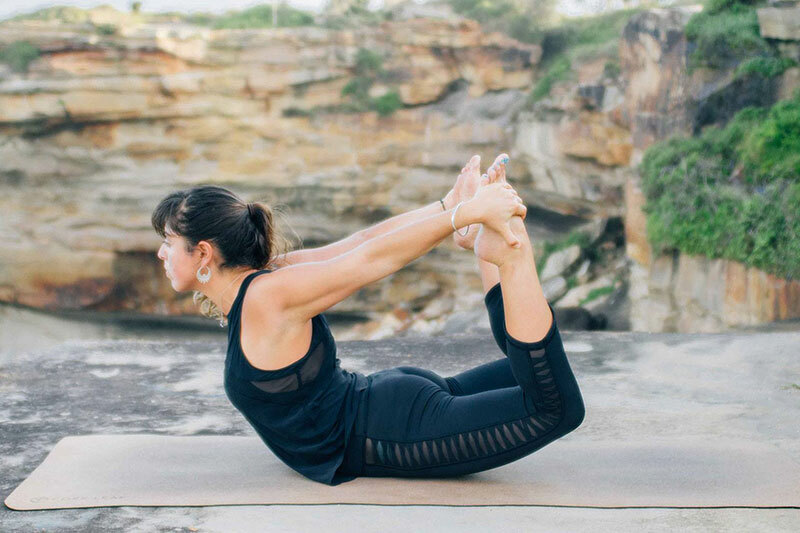 Nicolette Briscoe is a Sydney based yoga instructor and entrepreneur. Her mission is to make yoga and movement accessible to everyBODY, transforming the way we live, work and play. In 2016 she founded The Happy Living Project. Partnering with businesses and commercial property managers, Nikki implements customised corporate yoga and wellness programs for workplaces. 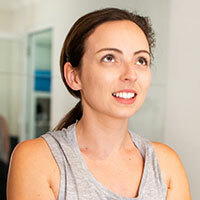 The business grew from humble beginnings to a network of Yoga and Pilates teachers across Sydney, Brisbane and Perth. All her teachers are trained to the highest standards. Importantly, they know how to be themselves and have fun connecting corporate teams with their passion for spreading health and happiness. Each teacher is hand selected by Nikki to ensure delivery of the best corporate yoga programs. The teacher ‘on the mat’ is only part of their story. Who they are ‘off the mat’ adds volumes to the practice you enjoy. Each teacher has been selected for their radiant smiles and happy, healthy lifestyles. Our network of teachers delivers the highest quality classes in a down-to-earth, accessible-by-all kind of way. Nikki was, until recently, a corporate marketer. Now, she brings her creativity to a flowing, nourishing yoga practice. 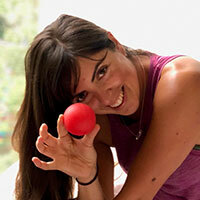 The focus of her classes is to make you breathe, smile, move and nourish - delivering vitality to each corner of the body. 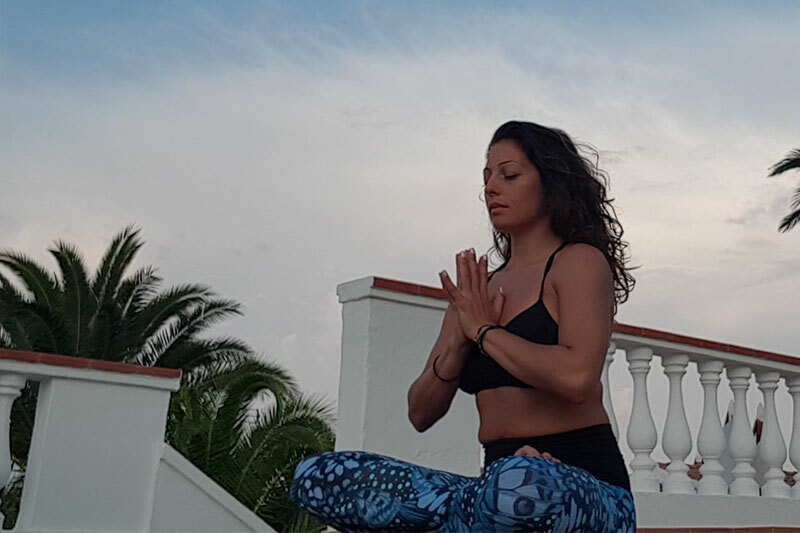 Theodora is a Holistic Therapist, Yoga teacher and speaker who has worked for over 10 years in the health and fitness industry, as well as competing as a Heptathlete. Pam left behind the corporate media and marketing world after the birth of her baby boy Sebastian in 2017. She credits Pilates with keeping her in shape physically and mentally during her pregnancy and now as a mum to a happily active and busy toddler. With a background in dance it was the fluid movements and the strength of asanas that drew Sam in initially - it just felt like home from the first practise. As Sam's personal practise evolved, she started to discover there was much more to Yoga and this is where her passion for yoga was really ignited. 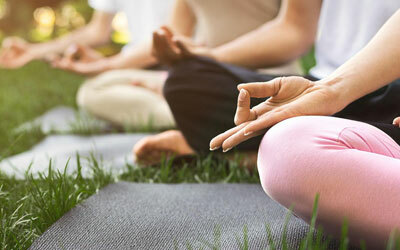 Beyond corporate yoga, choose from our exciting and unique range of workshops to add further wellness and mindfulness options to your corporate wellness programs. Curb the 3pm crash in your team. Interactive workshops teaching how to make healthy, nourishing treats like bliss balls and DIY vegan chocolate, just to name a few. Sessions to open up bodies and minds. Walk like a monkey, dance like a chicken, stretch and be still – workshops tailored for your team bonding sessions, conferences and events. Release trigger points. 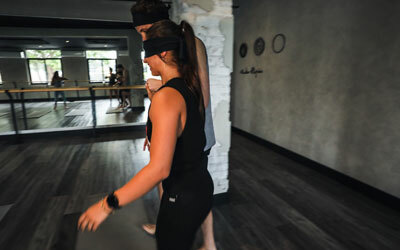 Using myofascial release techniques, massage balls and straps, these workshops stretch tight muscles to let go of painful distractions. Trigger point ball for each student included. Tips and tricks to calm the nerves. Workshops designed to arm your team with a suite of tools for managing stress in the workplace. Get them out of their heads and back into their work. Learn the art of yogic breathing Quiet the mind, allow thoughts to come and go and teach your team how to be more present in their every day. Skills they’ll appreciate at work and at home. Fun exploration of trust and balance A great event and team workshop, Happy Living Yogi Nikki leads your team through a few fun exercises in trust, with a bit of dance, laughter and balance using only four senses. The Happy Living Project started with the simple conviction that a breath and movement practice eases stress and provides greater work life balance. Today, this vision for a happier, healthier, higher-functioning workplace is becoming a reality – one forward-thinking company at a time. 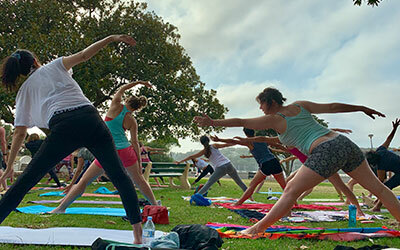 Our team shares a deeply personal and common interest in spreading the benefits of yoga and mindfulness practices to the working communities of Sydney, Perth and Brisbane. © 2019-20 The Happy Living Project. Nikki was, until recently, a corporate marketer. Now, she brings her creativity to a flowing, nourishing yoga practice. The focus of her classes is to make you breathe, smile, move and nourish – delivering vitality to each corner of the body. Her classes are strong and steady, helping participants build mental resilience, as well as muscle. She likes to flow, sometimes dance and sometimes get you to walk around like a T-rex – she doesn’t take yoga or life too seriously. But she really loves yoga and meditation and will take any opportunity to talk to someone about it. She is a 500hr certified Vinyasa Yoga teacher, 100hr Yin Yoga Teacher and Fertility Yoga teacher – and will very soon be teaching Pilates. Nikki is most passionate about empowering women – helping them find their inner fire, creativity and healing abilities. Read more about Nikki’s journey here. 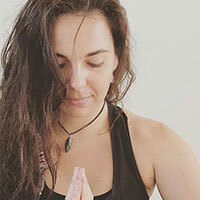 Theodora is a Holistic Therapist, Yoga teacher and speaker. After working for over 10 years in the health and fitness industry, as well as competing as a Heptathlete, Theodora brings her experience and knowledge to help others create a healthier BE-ing, on and off the mat. Theodora believes that the body reflects physically what is going on mentally, emotionally and energetically. That’s why she intuitively teaches a fusion of Hatha, sound, visualisation and breath. Theodora is passionate about helping people raise their Frequency creating awareness on how to live at a higher vibration. Pam decided to follow her heart and love of Pilates, retraining as a Certified Practitioner of Pilates Mat with Polestar Australia in 2018. 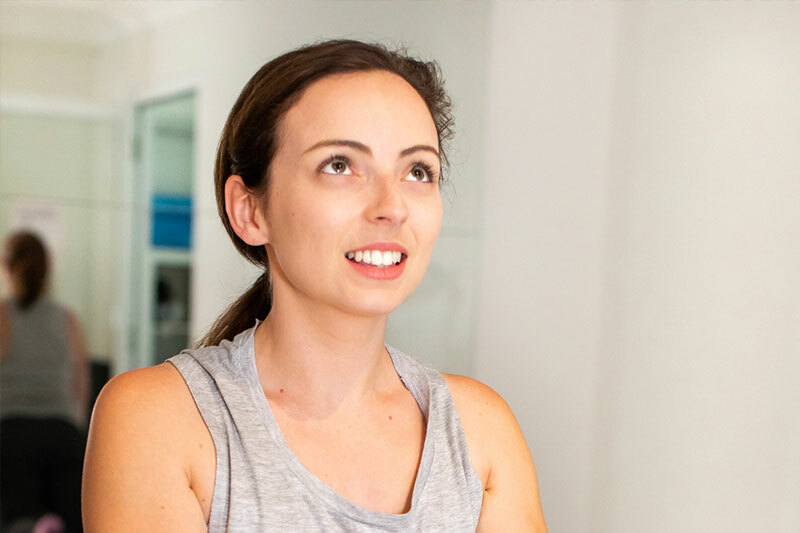 Pam decided to follow her heart and love of Pilates, retraining as a Certified Practitioner of Pilates Mat with Polestar Australia in 2018, and is so happy to be able to share her love of Pilates and its benefits with her clients across Sydney. Pam has a particular passion for pregnancy and postnatal Pilates, as well as using Pilates as cross training for sportspeople of all levels. With a background in dance it was the fluid movements and the strength of asanas that drew Sam in initially – it just felt like home from the first practise. With a background in dance it was the fluid movements and the strength of asanas that drew Sam in initially – it just felt like home from the first practise. Many years traveling the world as a dancer lead to feelings of instability and competitiveness. It was only on the mat that she was able to come to the realisation that the only person she was competing with was herself. As Sam’s personal practise evolved, she started to discover there was much more to Yoga and this is where her passion for yoga was really ignited. With over 8 years’ experience as a Pilates instructor Sam comes with a depth of anatomical knowledge and a true passion for mobility and working with your body rather than against it. You will find her classes influenced by traditional Hatha and Tantric teachings coupled with a juicy free flowing style that is driven by your presence and breathe.